I think for Rich (and not so Reach) apps, Silverlight is great. And for Reach (and not so Rich) apps, ASP.Net is best. Not sure about the choice at the bottom. If I was writing a non-metro non-LOB app for Windows would I go for HTML5? What's the installed based for ie9? I think the installed based for .NET 3.5+ is higher. Surely it also depends on the richness. I would probably go for Silverlight, given the trivial install time and good compatibility with WinRT. @Ben- That's also a fair "rule of thumb" for picking between Silverlight and web. @Joe- HTML5 install base is measured in terms of IE9. It's measured in terms of all browsers that can process and run HTML5- which is a lot. On the desktop- Chrome, Safari, Firefox, IE9/10, Opera (+ polyfills for older browsers). On mobile and devices- even better support. 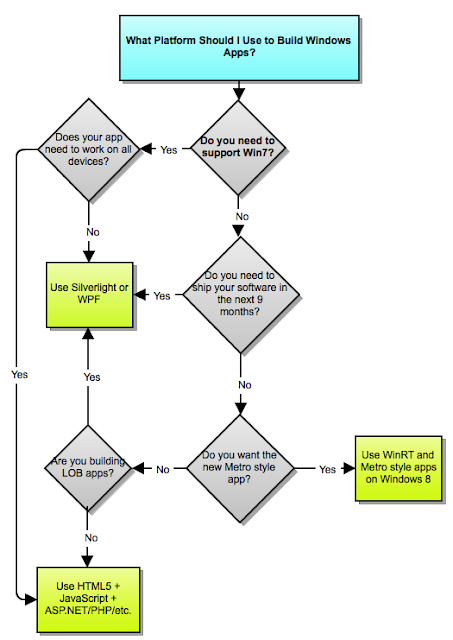 That said, if you don't really need to reach devices (like iOS and Android), Silverlight is still a fair choice. Ecellent overview. Love the flowchart with the decision points. Can't you just use the Modernizr js library to include html5 compatibility for older browsers? I didn't think IE9 adoption was any kind of a requirement. @Steve- Actually, Modernizr is just a simple API for browser "Feature Checking." It's not intended to add support for missing features (though it does "cheat" a little and add some basic HTML element support to older versions of IE). HTML5 install base is NOT measured in terms of IE9. It's an important part of the measurement (since it's the first HTML5-friendly MSFT browser), but it in no way is the entire measurement.